Michael Madsen (stars?) 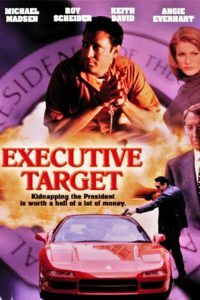 in this cheesy action caper from the team that brought us “Shotgun Jones.” Keith David has busted Madsen out of jail to kidnap The President (Roy Scheider). Will Angie Everhart switch sides? Will Madsen’s wife be allowed a bra as a hostage? Find out between ALL THE EXPLOSIONS of Executive Target! Cinemasochists’ What Happened series includes a presentation on the making of the chosen film, followed by a live riff performance in the tradition of MST3K. $5 cover, dinner, and drinks served to your table from the Westport Flea Market menu. Movie and riff rated R!